You can turn humdrum web sites into professional-looking destinations with the latest version of Cascading Style Sheets-if you know how to integrate CSS3 with your site's HTML. 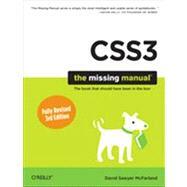 Enter CSS3: The Missing Manual. With crystal-clear explanations, real-world examples, and a dash of humor, this book helps you tap into the power of CSS3 to build new websites, upgrade existing sites, and prepare for mobile design. The important stuff you need to know: Design like a pro. Learn how to think like a CSS designer when writing or editing your HTML. Work quickly and efficiently. Develop timesaving CSS practices by following step-by-step tutorials. Make your site stand out. Design elegant layouts by using CSS instead of HTML. Go interactive. Add navigation bars and rollover links to guide visitors through your site. Build your audience. Learn which CSS3 properties work in the latest browser versions.